During Pittsburgh’s heyday, it was one of the most popular destinations for immigrants coming to the United States. 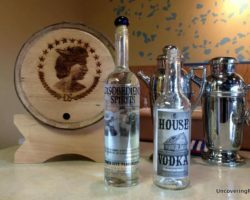 Each of these immigrant groups left their cultural marks on the city that can still be seen today in the city’s food and even in the Nationality Rooms at the Cathedral of Learning. It can also be seen in the city’s churches. Pittsburgh seems to be a city of churches, with spires visible throughout the city’s skyline. 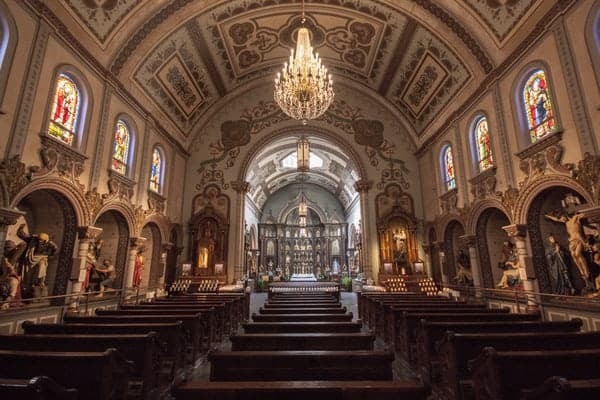 While some of them have been repurposed (like Church Brew Works in Lawrenceville) and others have been left to decay (like Saints Peter and Paul Church, a filming location for the movie “Dogma”), others have retained their incredible beauty and history. During my visits to Pittsburgh, I’ve had the chance to visit many beautiful churches in the city. The ones listed below are not only beautiful, but can also be appreciated by visitors outside of weekly services. 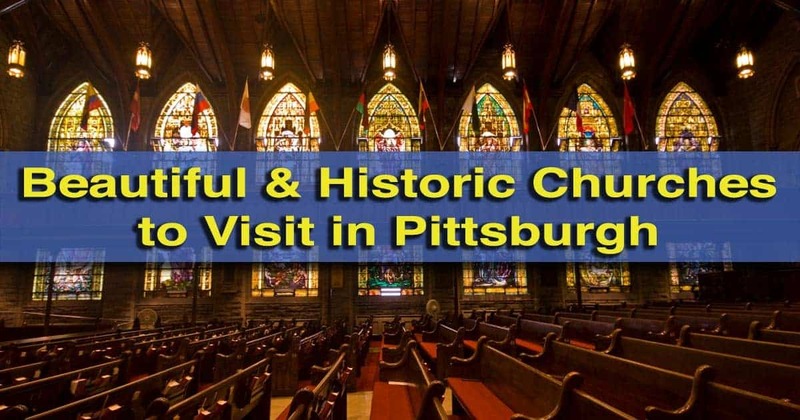 Whether you are religious or not, put a visit to these churches on your list for your next visit to Pittsburgh. There might be no more remarkable church in Pennsylvania than St. Anthony’s Chapel. Located in a residential area of Troy Hill, this church looks unremarkable from the outside. However, inside is a completely different story. 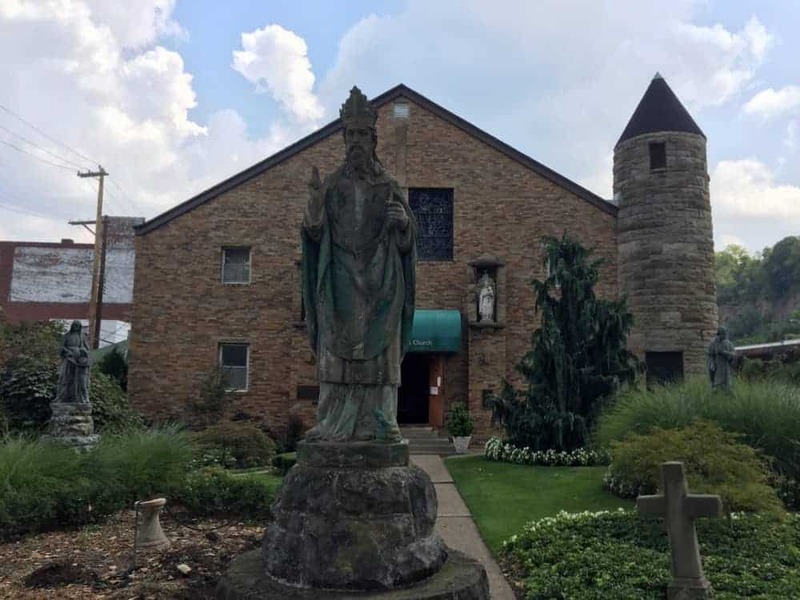 Few people know that this Pittsburgh church is home to the largest collection of Catholic relics outside of the Vatican. In fact, there are over 5,000 relics from saints dating back to Jesus’ Apostles. Tour guides offer a great overview of the church and how these relics came to be housed here. They also highlight some of the most remarkable items in the collection. For more information on this fascinating church, check out our full article on visiting St. Anthony’s Chapel. 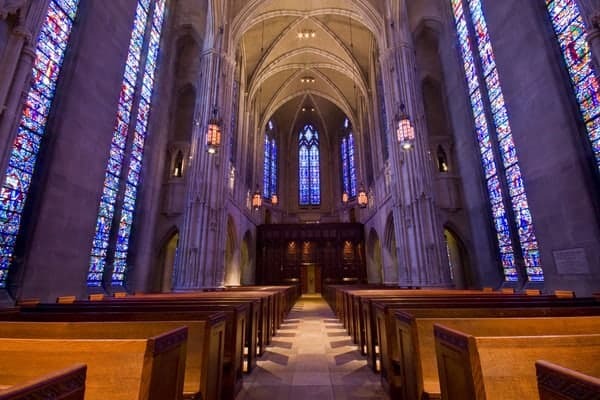 Located adjacent to the Cathedral of Learning on the campus of the University of Pittsburgh, Heinz Memorial Chapel is one of the most striking churches in Pennsylvania. Built between 1933 and 1938, this impressive chapel was built with money donated by Henry John Heinz, founder of the H.J. Heinz Company (though construction didn’t start until 14 years after his death). The chapel honors Heinz and his mother, Anna Margaretta Heinz. Today, it is used by the University of Pittsburgh for a variety of functions, both university related and religious. The chapel was designed in a French Gothic Revival style by the same architect responsible for the Cathedral of Learning. Inside, towering stained-glass windows highlight this striking chapel. For more information about visiting, head on over to the chapel’s website. The outside courtyard of Old St. Patrick’s Church. Old St. Patrick’s Church is another house of worship that looks relatively plain on the outside, and that plainness continues into the inside. However, it is the lack of ornate decoration that gives this church its beauty. Located in the Strip District, the current structure dates to 1936 and the stone tower is said to contain a piece of the famous Blarney Stone. Inside the church, a set of Holy Stairs leads up to the center altar, which is on the second floor. These Holy Stairs are one of only a handful in the United States and are modeled after the original Holy Stairs in Rome. 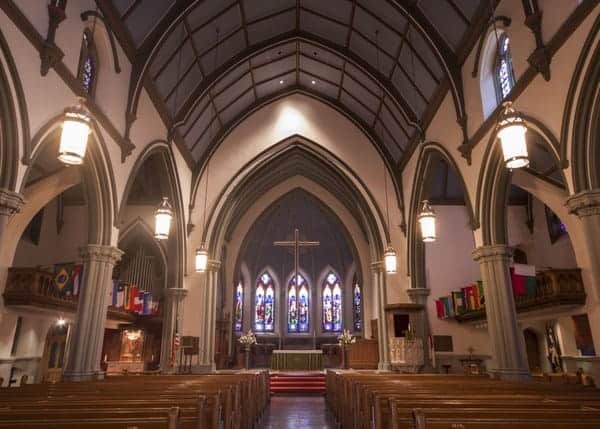 This church is open to the public from time to time, or can typically be seen on the Burgh Bits and Bites food tour through the Strip District. For more information on the church, visit its website. First Presbyterian Church of Pittsburgh is located on Sixth Avenue in the downtown area and is one of the city’s most beautiful structures. The fourth Presbyterian Church to sit on the site, this one was constructed starting in 1903. The interior of the church features 13 Tiffany windows, and more than 250 other stained-glass or leaded windows. The church’s Tiffany windows are 26 feet in height and were made using a technique only used for these windows, making them unique among the company’s creations. In addition to the beautiful windows, the church also features an organ with more than 4,000 pipes and huge doors at the front. I’m told that despite their incredible size, they can be easily moved by one person. Tours of the church are offered after services on Sundays, but visitors can also explore the sanctuary when open. For more information, visit the church’s website. 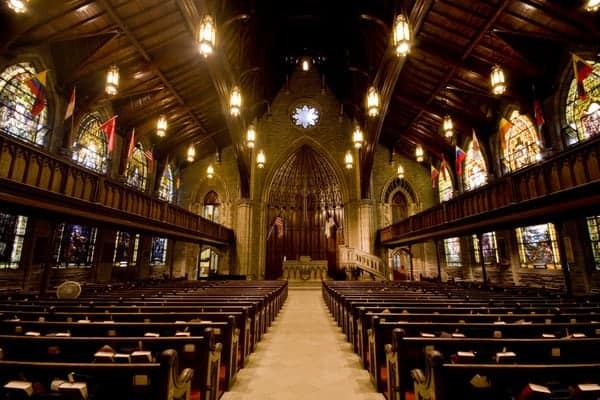 Located adjacent to the First Presbyterian Church is Trinity Episcopal Cathedral. The current cathedral dates to 1872 and is built in a Gothic style. It claims to be the city’s oldest unreconstructed landmark. The interior was redone in the 1960s after a fire destroyed much of the building. Outside, the church’s graveyard contains the oldest marked graves west of the Atlantic Seaboard. Built on an old Indian graveyard, the site is thought to have been the final resting place for up to 4,000 people, though many were reburied during the building’s construction. Today, there are approximately 125 marked graves in the cemetery. 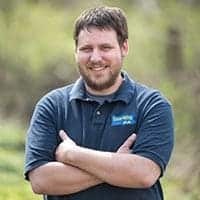 The oldest recorded burial in the cemetery is from 1762, but the oldest legible gravestone is that of Captain Samuel Dawson of the 8th Pennsylvania Regiment, who died on September 6, 1779. Also buried in the cemetery are Red Pole, a Shawnee chief, and Dr. Nathaniel Bedford, the founder of the University of Pittsburgh and the area’s first doctor. Strolling through the graveyard offers an amazing look back at the city’s history. Find out more about its history on the church’s website. St. Paul Cathedral in Pittsburgh. St. Paul Cathedral was constructed in 1906 and sits near the University of Pittsburgh. The mother church of the Roman Catholic Diocese of Pittsburgh, this cathedral is very impressive to see in person. Designed in Gothic Revival style, St. Paul Cathedral is 247 feet in height, with a statue of St. Paul mounted to the top of the structure. Inside, pillars flank the pews and create a very impressive sight. Find out more on the website of St. Paul Cathedral. St. Mary of the Mount Church sits high atop Mount Washington. Of all the churches on this list, St. Mary of the Mount Church is the only one I’ve never been inside. However, if you’ve visited Pittsburgh, it’s likely that you’ve seen this church. 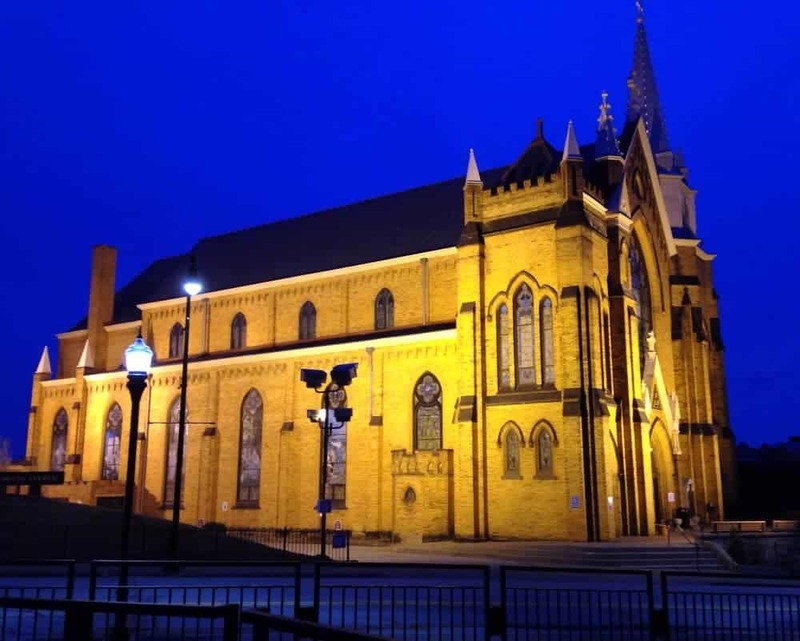 Sitting along Grandview Avenue on Mount Washington, this church can be seen throughout the city and is well illuminated at night. 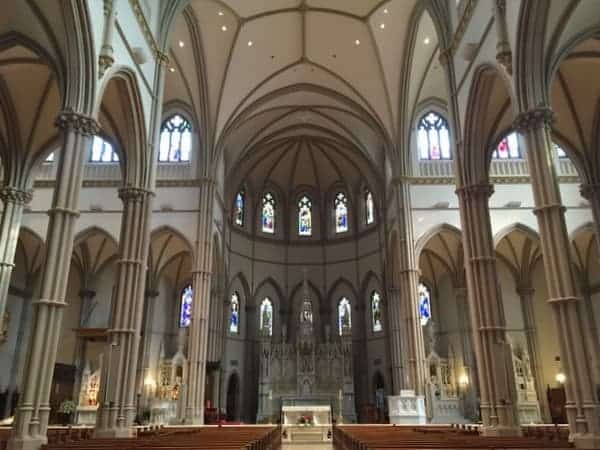 St. Mary of the Mount was completed in 1897 and features a beautiful interior. A steeple was added in 2000. If you visit Pittsburgh, make sure to take a trip up to Mount Washington to enjoy both the beauty of this church and its amazing view of downtown Pittsburgh. For more information on the church, visit its website. Want more great churches to explore? Check out our article on 7 beautiful and historic churches in Philadelphia. 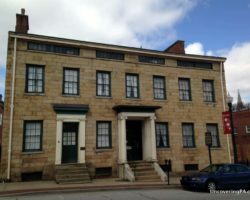 Looking for more to do in Pittsburgh? Visit the second largest university building in the world, the Cathedral of Learning, take epic Pittsburgh photos, or taste some unique brews at Church Brew Works. 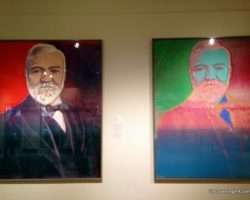 Jim…Thank you so much for posting these wonderful things to do and see in Pennsylvania. 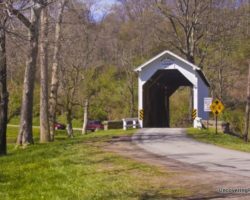 The trip we will make in the falll will be our third to Pennsylvania and we look forward with full enthusiasm and excitement to seeing so many of t he places you have posted! Please don’t forget to mention to the readers (maybe you have and I just wasn’t on your reader list yet) that the Hessians (including my great..great…great grandparents) purchased farm land there at the suggestion and with the money that Gen. George Washington gave them from his own pocket. They were a hard working lot and I believe that after fighting alongside these folks, that Gen. Washington knew that they would be a wonderful addition to our new country. Thanks again for keeping those of us who come as tourists in mind as you write your absolutely great blog! Love it! I am surprised you didn’t mention Immaculate Heart of Mary in Polish Hill. It is a beautiful church and historic landmark! It is beautifully decorated during Christmas! 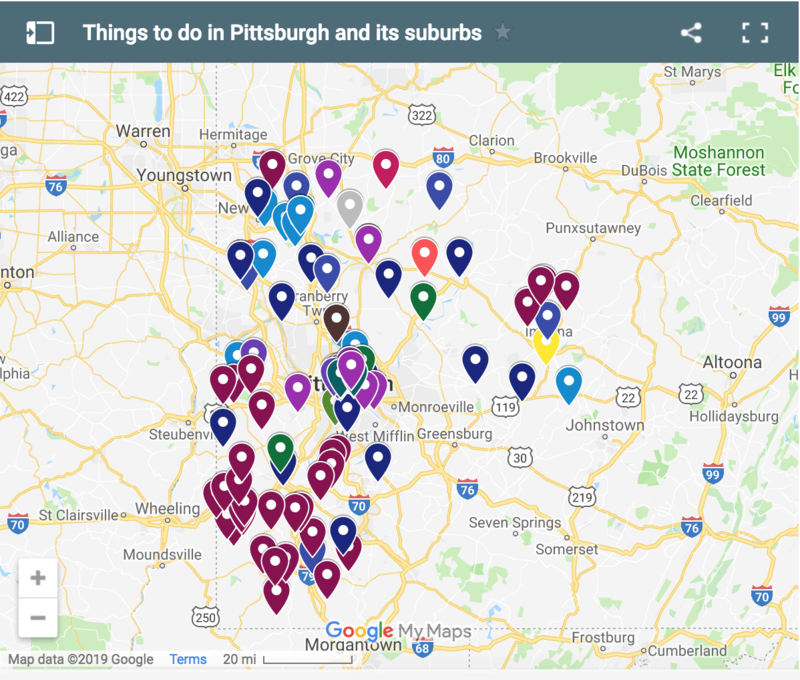 Oh, Jim, did you not get out to the East Liberty district? There you may find the East Liberty Presbyterian church, AKA the Cathedral of Hope. 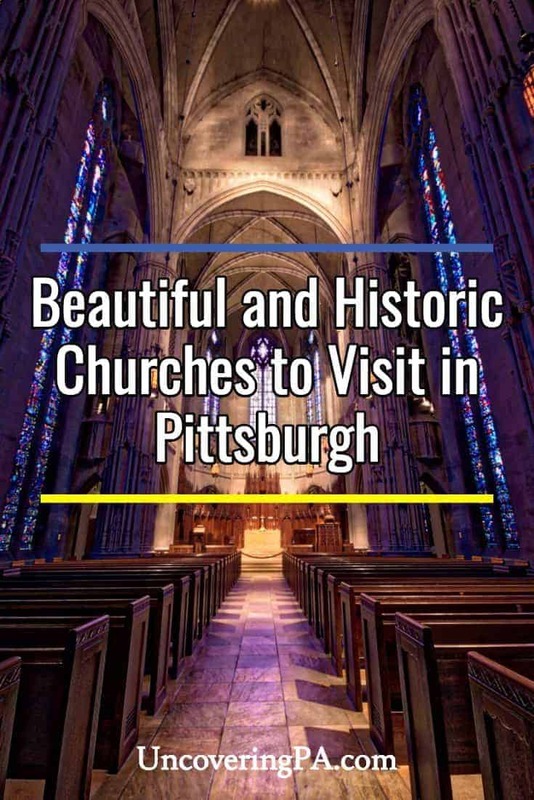 I have not been to Europe, but I would not be surprised if the East Liberty Presbyterian parish church were to be the equal of the great cathedrals of the middle ages. It is breathtaking.